The islands are not knitted, but woven, seems like a desperate search for a k...... In my opinion there are better extreme knitting examples, including the lovely Julia from KnitWits in Penzance, Cornwall who has knitted using Cornish Pilot Gig oars ( see juliaknitwits.blogspot.co.uk). 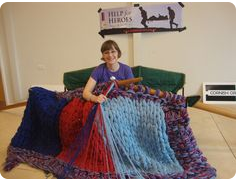 Another example of extremities in the British knitting community would be Rachel John who can be easily found on You Tube knitting a rug/carpet using 1000 strands of yarn. I don't know who did this first but I heard of it about 10 years ago and beautiful blends of colour can be achieved, along with massive biceps and blisters. If anyone knows who pioneered it I'd be interested to know. Hi Steph and welcome to the forums - thanks for this. I can't imagine knitting with oars (I usually tuck one needle under my arm) but I can imagine it would give you massive biceps and blisters. I know almost nothing about knitting, but I can't imagine how you could knit with a mostly-rigid material like wooden oars. Sure you can bend wood a bit, but doesn't knitting involve making loops (i.e. 180+ degree bends) in your material? You'd be a bit daft if you tried to make a 180 degree bend in a pair of wooden knitting needles.